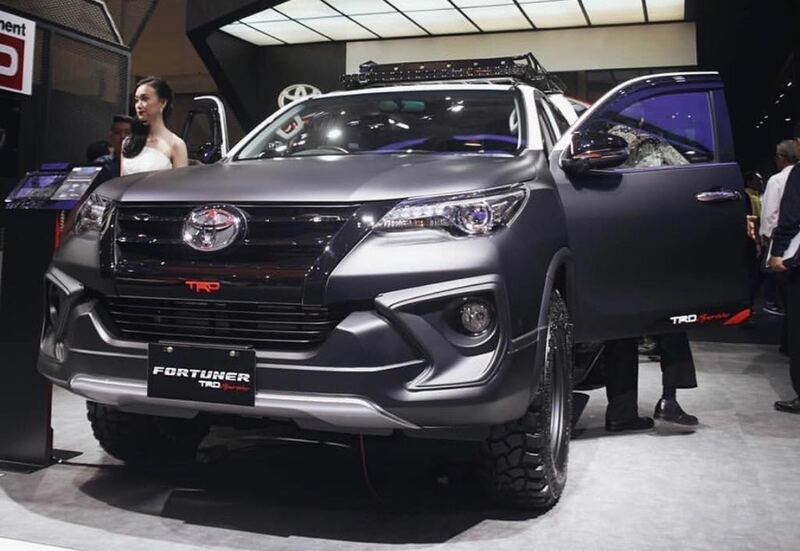 Toyota has showcased Fortuner TRD Sportivo in dual matt colour at the Gaikindo Indonesia International Auto Show 2018. The Fortuner TRD Sportivo made its global debut last year and it is popular among customers thanks to its sporty accessories. The Fortuner TRD Sportivo is finished in dual matt colour and it comes with new front bumper extension along with matt black finish for front grille, instead of chrome finish on regular model, and new fog lamp housing, giving muscular look for the SUV. The ORVMs are finished in black colour and the company has given LED lights on roof and a luggage carrier. The Japanese manufacturer has added silver finish for skid plates and side steps. The Expo model also comes with all terrain tyres with thick side walls and new alloy wheels, which is finished in matt colour. The rear also gets new body extensions and TRD badging on front, side and rear to make it stand out from regular. The interior is carried forward from regular model, but it is finished in black colour for sporty look and floor mats are also new along with new door sills. The Fortuner is loaded with lots of features which include new touchscreen infotainment system, electrically adjustable driver seat, push button start, key less entry, climate control and more. Toyota Fortuner is powered by 2.8 L four cylinder diesel engine producing 174 hp of power and 450 Nm of torque, the company is also offering petrol engine option as it is powered by 2.7 L VVT-I engine with 164 hp and 245 Nm. These engines are mated to 6 speed manual and automatic transmission with Power and Eco driving modes. The Fortuner also comes with four wheel drive option but it is available only with diesel engine. The Japanese manufacturer has given lots of safety features like 7 airbags, ABS, EBD, traction control system and down hill assist. In India, Toyota Fortuner competes against Ford Endeavour and Skoda Kodiaq.